Happy Monday!! Hope you all had a fabulous weekend! Today I've few random cards to share...I used few of my new goodies. The first one using Unity KOM..love,love,love the owlies.. The scallop border stamp is lovely and perfect for A2 cards...I heat embossed the border and colored in with Copics. Paper pieced the owls with October Afternoon papers...the sentiment is from Papertrey Ink. 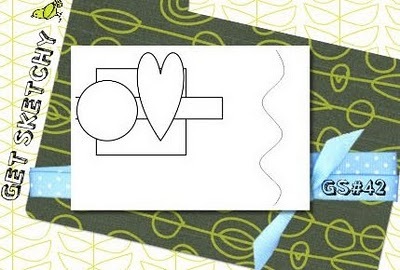 This card is for Allsorts Embossing Challenge. 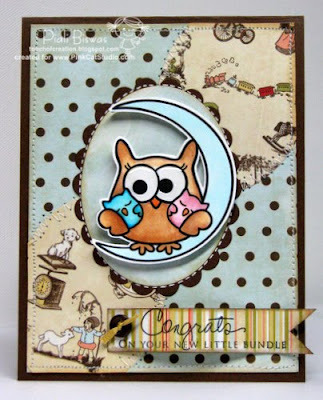 Next card is using Webster's Pages Lullaby Lane paper.. The paper is so pretty....I didn't do much on it ..kept it very simple. Created a simple border with some vintage lace and sheer Polka dot ribbon... stitched the ribbon and ruffled it up for the cute look. 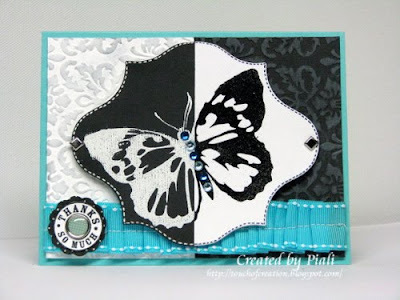 The butterfly is a PTI die cut ..embossed it with Cuttlebug seeing spots folder. The sentiment is from Papertrey Ink...added some Prima pearl flourishes for sweet girly look. Creative cottage: Pearls and Swirls. Create 4 Fun: Baby card. Really Reasonable Ribbon challenge#2: Ribbon border. Welcome to Pile It On ---ALL ABOUT PAPER CHALLENGE. 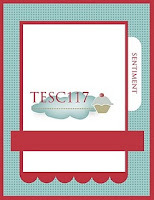 This week we have a fab sponsor.. PAPER TEMPTRESS..
Today I've used the most fun cardstock ...its a double sided one with the most trendy color combos..
SORBET DOUBLE SIDED 105lb cardstock. 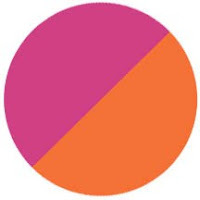 My colors is Watermelon/Mango..how fun!! 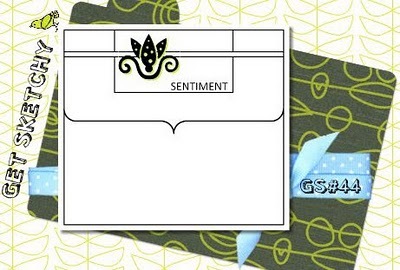 Its double sided so I like to use it for flower making and fun fold card...I'll post few samples this week. 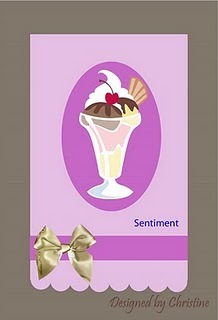 The chocolate sheer ribbon is also from Paper Temptress.. I've used Papertrey Ink ~Flutterby Friend and Retro background stamp sets. The cute Butterfly charm is from Stamp and Create . Pile it On - Fold it, bake it, do something with it..that is Paper. Practical Scrappers - Flowers . Kah-wink-e-dink - FREE FOR ALL!!! Little Paper Shop: Bright and Colorful. Crafty Creations: Add shine to your project. Paper Cutz: Use circles, squares or stars....I used tiny circles on the background. Fresh Brewed : Anything goes. I Did It Creations Challenge: 3-D...add some kind of dimension. Paper Playtime: Bugs, Bees, Ants or Ladybugs. Bunny Zoe's Crafts: Nice and girly. Stamp and Create challenge: Charms. 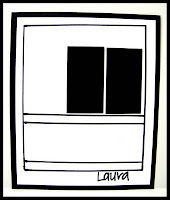 Digi Doodle Shop Best: Anything Goes. 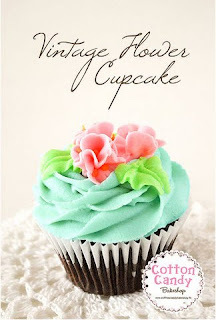 Here is my take on the inspiration...the cute digi cupcake is from TREEHOUSE Stamp..its a Freebie. Stamptacular Sunday challenge: Stars and stripes. One stitch at a Time: Stars and Stripes. ABC Toys and Crafts: Red,White and Blue. So playalong with us ...use the cupcake as an inspiration..colors,theme...anyway you like and post a direct link to project HERE..
TERESA , RACHEL, KAREN, KRISTIN. This month theme is COLORS... I love the Hawaiian shores the most.... my fave combo is Hawaiian Shores, Orange Zest with Kraft/white. 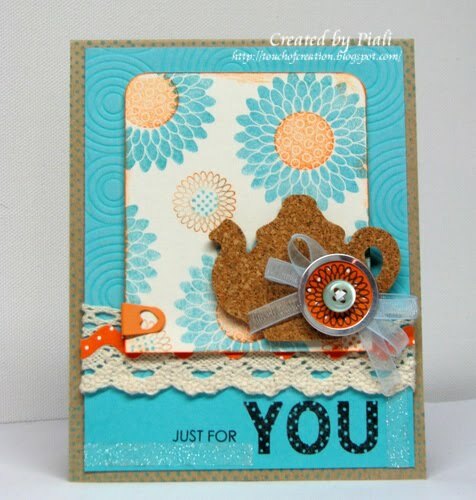 I've used All About You set for my card today with all time fave Polka Dots BasicII. I love the new teapot die. Vintage lace, Ribbon, PTI~ Vintage button, Cork sheet, Glitter, Score tape. 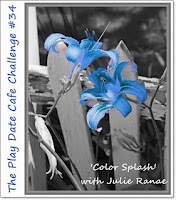 I’m looking forward to visiting all other participants to check out their color combos! 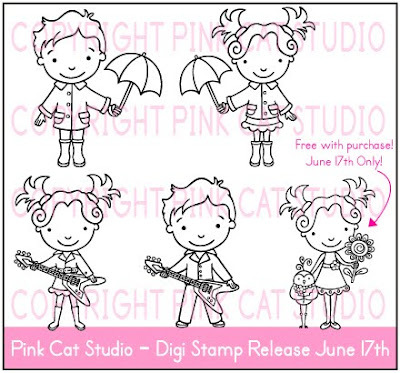 Today we've a Super Fun PINK CAT STUDIO digi release...I say it every week isn't it?? Actually its true each and every PCS releases are Awesome!! Gotta love them all. 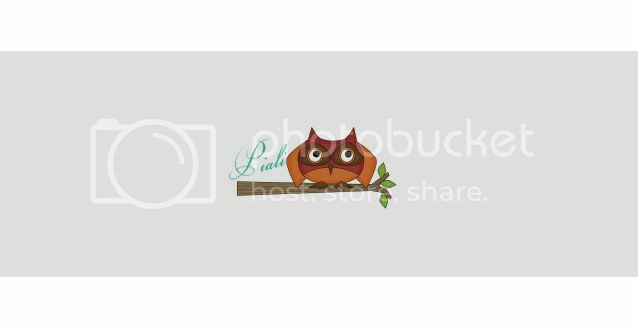 A new set of super cute Owl and Billy images...just check out the fabulous FREE Lily Image we'll get with your purchase TODAY! 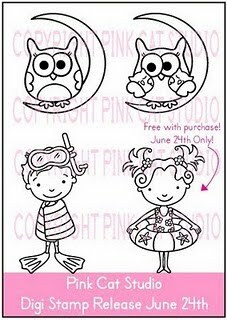 Today, June 24th, when you purchase anything from the digital or rubber stamp stores you will receive the "Lily in Her Inner Tube" digital stamp for free! It will be emailed to you separately and within 12 hours after you make your purchase. 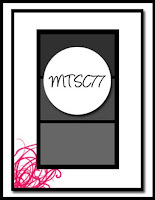 Now the most fun part...my card. 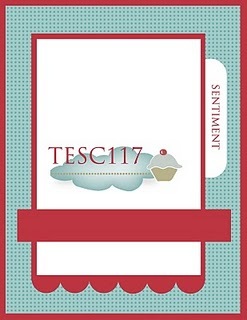 Really I'm super excited to share with you the fun interactive card.. Yep!!! The image moves in a cradle motion...Thanks to Melissa ..she made it into a collage so its easy to show. I'm not a techy person..so I don't know how to post a video ..this works isn't it??? Its super easy to create..
1. Print two copies of the same size image. 2. Trim them out..color one of them. 3. 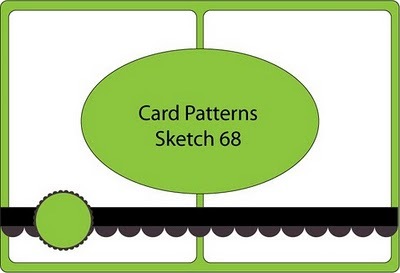 Attach the non-colored/ blank image to the card base with an eyelet. TA-Da!! you've a interactive baby card.. Hop over to PCS blog for more Eye-candy!!! Papers: Webster's pages~ lullaby lane, Bazzill cardstock. Copics, Nesties, Memento ink, White Gel Pen, Eyelet, Button, sewing machine/thread. Wow !!! 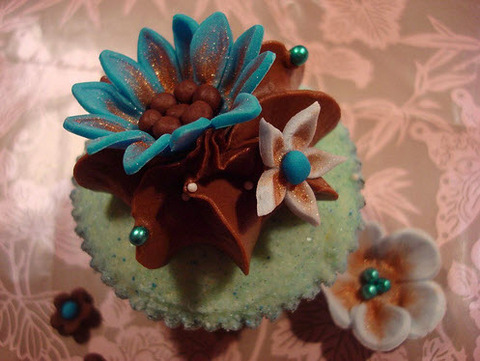 It looks so lovely..I can hardly eat this beautiful artwork. Here is my take on fab inspiration.. I created the background with all the Hero Arts thank you I've...arranged them on a clear black randomly and stamped it on October Afternoon paper. Fun with Shapes and more: Flowery. Post a direct link to your CIC project Here by June 26th. I love this fun Split technique..used it after a longtime. This card is for one of my very good friend....she wants to learn how to stamp so I made a stamping gift basket for her with few of her fave stamps..and all the basic stamping supplies. I used new Cuttlebug embossing folder and Inkadinkado Butterfly stamp . The sentiment is all time fave ----Hero Arts. 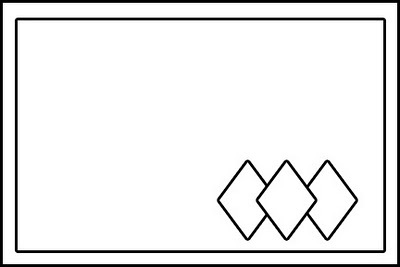 Really Reasonable Ribbon challenge #2: Ribbon border. Flourishes Timeless Tuseday : Embossing. I've used 2 Sketches 4You sketch and Dawn's Color Cue color combo for this summer time card.. 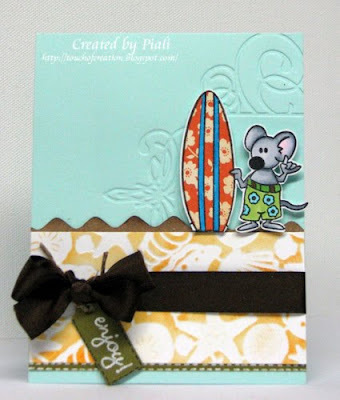 Miles surfing is perfect for this week's Kraftin' Kimmie Beachy Keen challenge. I really wanted these new Miles stamps for this challenge..thanks to Lacey of Stamp & Create...she really ships the order quickly, I always get it within 2-3 days with a special surprise gift..love it! A cute set of Lily and Billy Digis...and check out the Cutest FREEBIE ever!!! 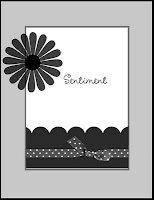 Today, June 17th, when you purchase anything from the digital or rubber stamp stores you will receive the "Lily & Tweet Holding Flowers" digital stamp for free! It will be emailed to you separately and within 12 hours after you make your purchase. 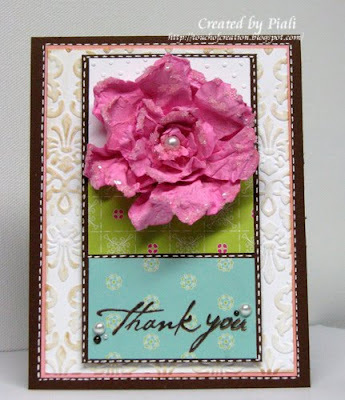 I've used sweet Lily in her rain gear digi and fabulous October Afternoon papers for this card. The fun sketch is from this week's GETSKETCHY challenge. This summer themed card is for the following challenges.. The Shabby Tea Room: Summer Fun. Crafty Creations: It's a Stitch Up. Now the next card ....using Billy -the Rockstar. He is super COOL..isn't it?? I like this black/orange/green combo..very simple yet cute card. Creative Inspiration: One for the boys. Incy Wincy: One for the Guys. 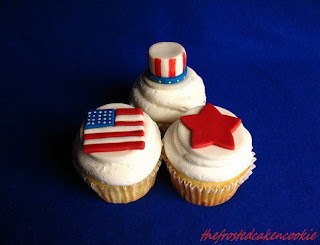 Cupcake Craft: One for the boys. 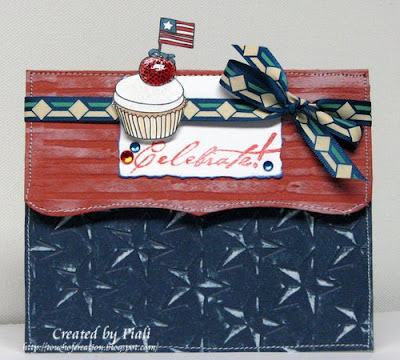 Make sure to check out PCS Blog for fabulous DT creations...they are one creative bunch of ladies..always amaze me with their unique creations..
Paper: October Afternoon~ Fly a Kite, scraps, PTI ~Kraft cardstock. Stamps: Lily in her Rain Gear ~ Pink Cat Studio. Copics,Papertrey Ink Ric-rack die, EK Success border punch, Distress Ink, Sewing machine/Thread, Jeweled brads. Papers: Die Cut with the View, Bazzill. 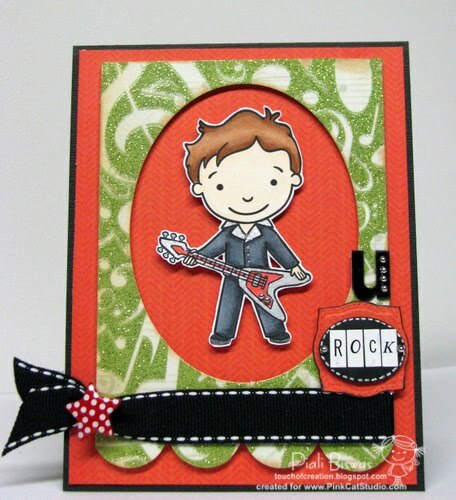 Stamp: Billy Rockstar~Pink Cat Studio. Hope you all had a lovely weekend!! I had a very busy one. Seven more days of school...then I'll have more crafting time I hope..lol. 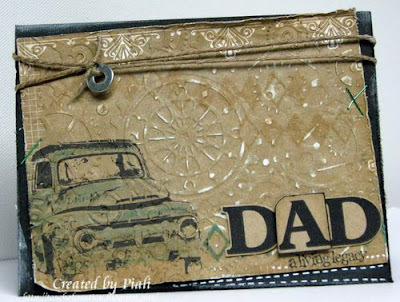 Today I've a father's day card to share with you all.... its quite my style...black/kraft with embossing and Awesome Digi from Whimsy Haven. I generally like the distress shabby look on my male cards. The embossing folder is the new one~"Clockworks" by Cuttlebug....I sanded it a bit. Simply Saturday: Sponging...I also sponged the digi image with distress ink. My Partner in Crafting Crime: Male cards. 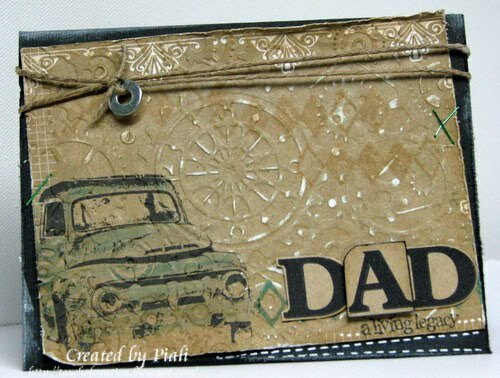 Stampin' Sister in Christ: Father's day card. Cards For Men: Father's day. One Stitch at a Time: Celebration. Hi!! Its time another CUPCAKE INSPIRATION CHALLENGE,CIC#63..
Love the soft colors of this Yummy inspiration!!! Here is my card ...with a handmade paper flower. Lot of homemade stuff going on...I made my own Sparkle mist.. using water, few drops of Distress Ink reinkers and a little bit of Perfect pearls powder. If you look at the flower up close it has a nice shimmer to it. 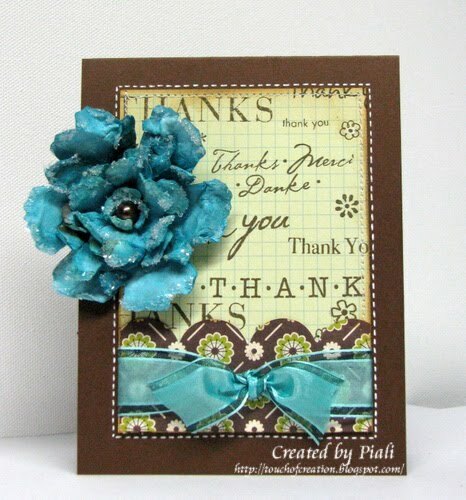 I used Tim Holtz's distress flower Sizzix die for my flower. This card is based on Mercy's lovely sketch. This week's fun Pile It On Challenge is :SUMMER SHOWERS"
I used Crissy Armstrong's Whimsy stamps Digi image.... this digi was created and offered free for a good cause..read about it HERE. As I wanted to send a card to Jayme but not for the prizes so I waited till the RAK got over..
Simon Says Stamp - 1 image; 2 DPs & 3 embellies.... the sentiment is stamped on a piece of scrap old DP...it also had a little red on it which I covered with little paper lace. So play along with PIO challenge...and make sure to post your entry HERE by June 19th.